This is how Carlos, a regular at Anita’s, describes it. 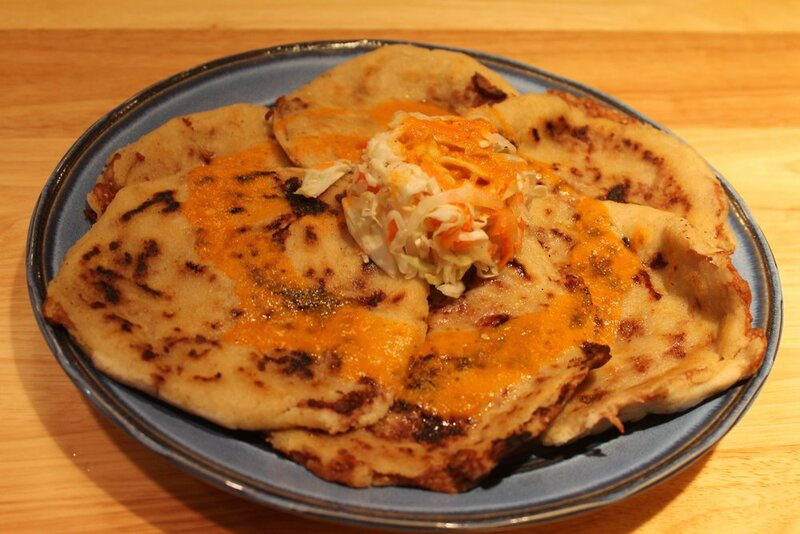 Pupusas are one of the staple traditional foods in Salvadorian cuisine. They are not over the top creations, in fact they are the complete opposite. Simplistic in design. “Pupusas are made of rice flour, for the dough, and stuffed; with cheese, beans, pork, and other vegetables.” Said Anita. “The salsa and curtido remain largely the same but some places add parmesan cheese to the mix.” She checks up on the line. “Seis rebueltas por favor.” Customer asked “Está bien.” Anita replied “Thanks to the simplicity of the Pupusa, they have been able to get to where they are now. Helping the Salvadorian people on the way as well.” She finishes as she puts another six on the stove. To understand what she means we have to start in the 60’s as the population of El Salvador began migrating to other areas they eventually arrived in Honduras and Guatemala spawning Pupusa stands all over. During the 80’s, once again the Pupusa made a move. The Salvadorian civil war forced a migration to other countries. Countries such as the United States and eventually Canada and Australia. Because of these events as Anita describes it, Pupusas over the years have not only become synonymous with El Salvador or its people, they have helped the Salvadorian people, cope with a war that split them and has since made it tough for success in El Salvador. Yet here, as she makes her Pupusas, in her food truck, “We are growing and becoming part of the community where ever we may be. We make a dash for better things in the future for my family and my people one Pupusa at a time.” Anita smiled as she served the six Pupusas to go. So don’t forget that if you ever find yourself in the mood for an affair of your own, make your way to Anita’s Salvadorian Food and make it official. Because cheating has never tasted this good.